How would the Foot Ninja get into and out of that thing and how does in make turns? Speaking of toys, any news on the NECA TMNT second wave? In 1993 Playmates made a Technodrome Scout vehicle that is vaguely reminiscent of the Sewer Scraper. It opens in a similar fashion and has the one man cockpit. 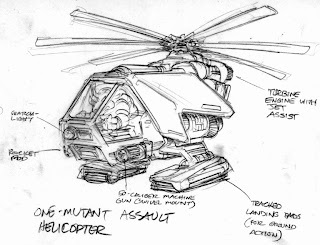 Do you know if the concept for it was borrowed at all from this design? I love the Sewer Scraper. Looks like something you'd encounter in a D&D dungeon. "Okay Sarah, roll your traps skill." "Okay, your rouge hears a rumbling in the distance. 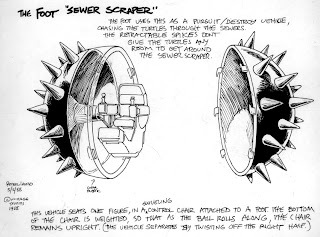 Something big and round and spiky is rolling right at you..."
In 1993 Playmates made a Technodrome Scout vehicle that is vaguely reminiscent of the Sewer Scraper. It opens in a similar fashion and has the one man cockpit. Do you know if the concept for it was borrowed at all from this design?" How would the Foot Ninja get into and out of that thing and how does in make turns?" I believe that in my original conception of this vehicle, entry for the driver would be via a hatch built into one of the spiked sides (hidden from view in the artwork right now, of course!). And given that the way I envisioned this thing would move forward or backwards involved the spiked halves rotating one way or the other independent of that transparent "window" strip in the middle, steering would be similar to the way tracked vehicles are steered -- stop the right "track" and the vehicle will go right, and vice versa. If there had been interest on Playmates' part in this idea, I most likely would have done more drawings to illustrate these features, but it unfortunately ended with this one piece. "Speaking of toys, any news on the NECA TMNT second wave?" "The last time I checked, about three weeks ago, with the appropriate Mirage staffers, NECA was -- for whatever reasons -- incommunicado. I have heard nothing else since. I don't know what's going on with them. Like many fans, I really want to see them do more figures, and hope this does not bode ill."
I hope this isn't the case, since I don't believe that either are really intended for the same market, and can co-exist. Also, do you know if Playmates will expand this line past the Turtles, Splinter, Shredder, and the Foot? I wonder why Playmates decided to finally utilize comic-based figures when NECA has already produced better ones? I'd rather they have seen them save the new sculpting for the classic/toon figures. I wonder why Playmates decided to finally utilize comic-based figures when NECA has already produced better ones? I'd rather they have seen them save the new sculpting for the classic/toon figures." You are, of course, entitled to your opinion. But in my opinion, having seen and held these new figures from Playmates, I think they are equally as nice as the ones that NECA did. The cool thing about this -- from my perspective -- is that with these Playmates figures and the NECA ones, we now have two very authentic-looking steps in the TMNT's comic book look "evolution". It's no secret that as Kevin and I drew more issues of the book, the Turtles started to look a whole lot different than the way they appeared in that first issue. NECA did an absolutely fabulous job of capturing the look of those first issue Turtles, something that had not been done in toys before. But now Playmates has done a wonderful job of capturing what you might call the "modern" look of the comic book style Turtles. When I look at these figures, I see the way that I draw the Turtles now. -->> ..then it's pretty funky, if NECA's deal is still on in some form or another..
we're gonna be getting two different lines on COMIC based Turtles. Playmates figs really do look like the Mike Dooney and Laird cover there. Well, as far as the new playmates figures go, I'm honestly not too impressed with the pictures we've seen of the turtles themselves, but I'm hoping they just turned out badly.